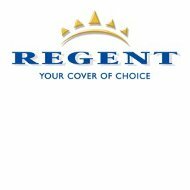 Regent Health Insurance Company is a South African health insurance provider. The company, which was established under the Imperial Corporation umbrella, also offers life and automobile insurance. In addition to offering coverage in South Africa, the company insures individuals and corporations in Botswana and Lesotho. Regent Health Insurance Company offers Personal Accident plans for employers to offer to their employees. For information on the Personal Accident plans, interested individuals should call the company at 0860 REGENT or 0860 73 43 68. Regent Health Insurance Company offers additional benefits under their Consolidated Provider Plus Plans. Within these plans, you can find additional coverage for accidents. Should you find yourself a victim of an accident, which leaves you unable to work, you can receive monthly payments for up to a year. The only requirement is that you be under age 65. Another option for accident benefits includes tragedies in which the individual loses a limb and is unable to return to work. Payments will be made to help cover income lost. In addition, benefits are awarded for therapy and rehabilitation. The number to the policyholder Care Line is 0860 73 43 68. Lawcall is a customer service line to help policyholders with any legal questions, tax concerns, and counseling services for families and individuals. Regent Health Insurance Company provides a cash distribution every five years to its policyholders. The amount is determined upon being paid out. Only current policyholders whose accounts are current will receive this benefit. If you are a Regent Health Insurance Company policyholder and do not receive a paid maternity leave or are unable to work due to pregnancy, the company automatically pays maternity benefits upon the birth of the child. However, there are exclusions to the policy. For example, if you have a pre-existing condition, it will not be covered under the Travel Insurance. There is also an age limit and pre-approval for certain countries or activities that may prohibit you from obtaining coverage under the Travel Insurance policy. The Travel Insurance also requires you to obtain pre-approval for medical expenses that exceed the stated amount within your policy. Claims are filed by health care professionals. However, the claim forms can be downloaded on the company’s website. Claim reporting and checking on the status of the claim can be done by calling the Western Cape Regional office at (021) 913-8846. Regent Health Insurance Company Career openings can be viewed on the company’s website. Each position is itemized with the number of job openings listed beside it. Once you see a position that interests you, expand the title to review the job, company, location, and the deadline for accepting applications and resumes. Job duties, requirements, qualifications, and what the company is looking for in a prospective employee are all listed for your review. After reviewing these guidelines, interested employees have the ability to apply for the position. The company website also provides the option to perform job searches by category or region. If you wish to create an account to return to the site to review openings, edit, or update your information, Regent Health Insurance provides the ability to establish your own account on the website. You can also email the company at [email protected]. If you are looking for health insurance, compare rates by typing your zip code into the toolbox now.